Hello friends! I hope your week is going well! I'm not feeling great today, but I do have a card to share with you. I made this for the SCS sketch challenge, using the special Anniversary Release at Our Daily Bread designs. Once again, this was the sentiment I submitted, and it is in the set called Sentiments Collection. I also used the dragonflies from Faithful Friend. I used Flourishes White Card Stock, Memento Bamboo Ink, Alcohol inks for the dragonflies, EK Success Lattice Punch, May Arts Ribbon and a Spellbinders Antique Frame & Accents set for my frame. I inked the negative part of the Cuttlebug folder for the darker panels, and just sponged lightly on the raised part of the lighter panel. That's it! CAS for me! Thanks for stopping by! 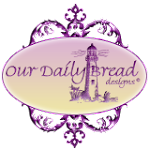 Don't forget that there is a Customer Favorites contest going on until Monday 11:59PM EDT over on the ODBD Blog! Lots of chances to win free sets and guest design for the release if your favorite is chosen! Read all about it here! No eye has seen, no ear has heard, no mind has conceived what God has prepared for those who love Him! Awesome Creation! Love the dragonflies. GREAT JOB! Oh green is one of my favorite colors and this card is gorgeous. Hope you feel better soon! As always, Grace, this is fabulous....I love the green. Your special touches are always so beautiful...just the right touch! Sorry you're under the weather, Grace. I hope you feel better soon. Your card is absolutely gorgeous! 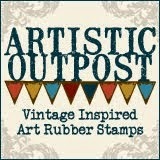 I love the rich green, the embossing and the ornate diecuts! Feel better! Just beautiful...Really like those dragon flies...Hope you are feeling better! Gorgeous! Love all of the layers and the embossing! Hope you feel better soon. Blessings! Hope you are feeling better soon. Your work is so beautiful. Each time I click on your blog email, I hear the music and feel my stress (a lot of it lately) melt away. Thank you for such a nice gift each day. Grace, I'm praying that you feel better real soon! 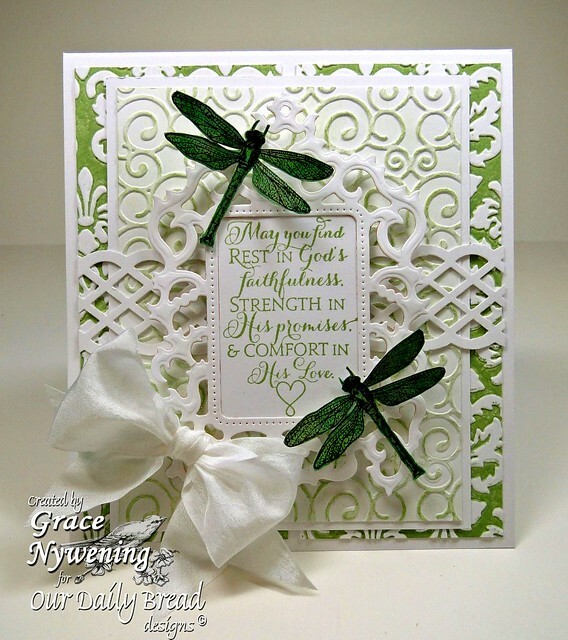 Your card is gorgeous - love those diecuts and the dragonflies are a nice change from butterflies! Beautiful bow! What a lovely card and the sentiment is wonderful. Stunning!! Green is my fave color and I love the textured layers...so beautiful! 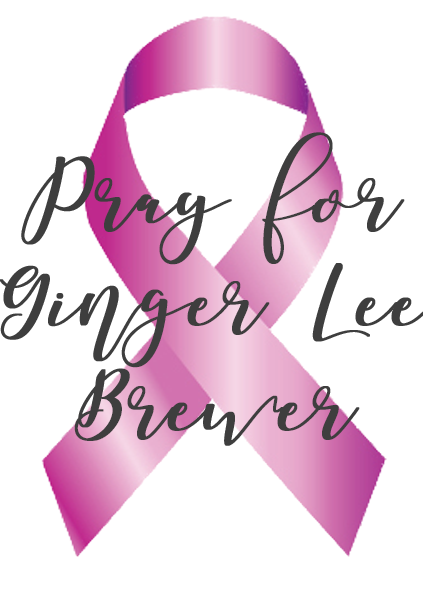 Sorry you are under the weather...praying you'll be feeling better real soon! wow Grace, this is stunning. 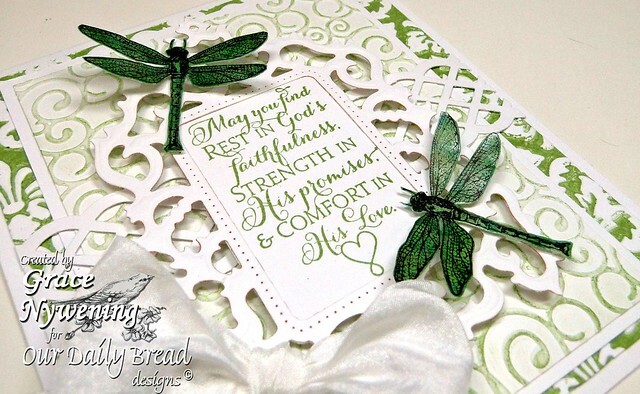 Love the green and white and love those dragon flies. Simple, elegant and GORGEOUS! Love the sentiment. Perfect! Elegant and beautiful card. I love the contrast between the white and the green! Thanks for playing with us at Get Hippity with Ippity. Lovely card. Really like the color and dragonflies! Stunningly beautiful! I just love the colors & More importantly the Sentiment!! Love the Song Blessings on your Blog--One of my most favorite of all time!! Thank you so much for joining us this week at Love to Create Challenge & for sharing your talents with us! We hope to see you back again really soon!! Oh my, this is just stunning!! Gorgeous details!! Thanks so much for joining us this week at Love to Create Challenge. gorgeous! I love the textures and details and the green and white combo are just fabulous! thanks for joining our challenge at Lollipop Crafts this week. Beautiful card, hoping your feeling better. Well, I just got a chill-your stunning card and lovely music-really touching. This is beautiful, Grace, just beautiful! I am so glad you joined us for this week's challenge at Sassy Cheryl's!